Opened in 1925, the Fairmont Jasper Park Lodge Golf Club quickly has become one of Canada’s premiere golf courses. Over 50 teams of horses and 200 men worked for a year to clear the debris from the land it was built on. 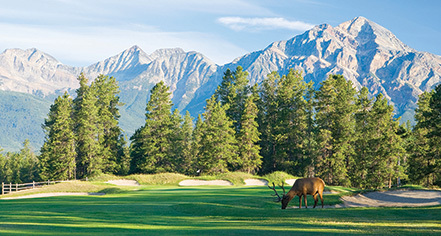 Deep in the heart of the Canadian Rockies, architect Stanley Thompson designed the 18-hole layout with elevated tee boxes, dramatic bunkering, wide fairways that weave their way through forest, and effortlessly blended the landscape into challenging terrain without being a disturbance to Mother Nature’s natural curves. A restoration project in 1994 has led to this 71-par course being highly acclaimed for its layout and beauty, winning several awards with SCOREGolf magazine. Rentals are available to guests, and there is also a golf shop featuring current popular clothing collections and souvenirs. The award-winning 7th Tee Snack Shack provides patio seating, barbeque style food, and hot dogs for refreshment between rounds.